Avoid State fines and penalties for failing to have completed your Continuing Education Requirement. Subscribe to Free Reminder Notification. 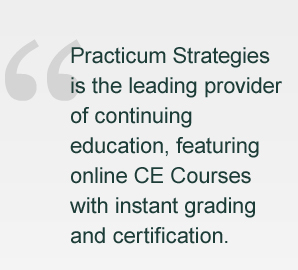 Practicum Strategies, the leading provider of continuing education, features online CE Courses with instant grading and certification. Practicum Strategies takes pride in the fact we are continually searching for new course materials that we can offer our clients. This increasing variety of subjects will assist in broadening your career goals. Designed for the active professional, we are your complete and instant resource for all of your CE needs, 24/7, 365 days a year! Our website gives you instant online access to all of your course materials. You can study at your own pace from home, or at the office - anywhere there is an internet connection. Practicum Strategies’ interactive website features online quizzes and instant access to your certificate of completion. There is never a delay waiting for a certificate to be mailed. or by e-mail at info@pshomestudy.com. If you need support in the evening, weekend, or on a holiday, please send an e-mail or leave a voice mail and we will get back to you as soon as possible, usually within a few hours. Our dedicated staff is completely familiar with the regulations in each of the states that require continuing education. We will gladly assist you in making the right course selection to fit your needs.